All transactions are safe and secure with a reliable history in online purchasing behind each of our associates. 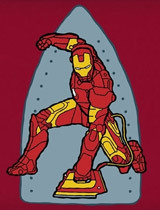 Buy the Ironing Man t-shirt to own Iron Man clothing and merchandise. The front of this humorous tee displays an image of Iron Man with an iron in his hand. Putting two and two together, this Ironing Man design provides plenty of comic relief for both casual and diehard fans of the superhero. For a wealthy industrialist like Tony Stark, you would think that he would have been able to create a wrinkle-free armored costume. In addition to the Ironing Man tee above, browse the Iron Man Clothing Gallery for more apparel like men's and women's clothes, kids shirts or hoodies.